Peter has cystic fibrosis (CF), a life-shortening genetic disease that clogs his lungs, digestive system, and sinuses with thick sticky mucus. CF is not contagious and does not affect Peter’s mental abilities. However, some accommodations are necessary to keep Peter as healthy as possible while in your care. 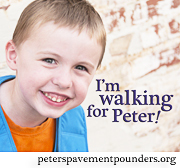 Although Peter has a serious health condition, we try to keep life as normal as possible. Let us know if there is any other information we can provide to make his time with you a positive experience! Peter does not have any food allergies that we know of, but before he eats, he must have medicine. His body can’t digest proteins, fats, starches or complex carbohydrates on its own. So, he takes pancreatic enzyme supplements (Zenpep) to help his body digest his food. The only exception is water, fruit, juice, or treats that have only simple sugars in them. Right before a meal, open 3 capsules of Zenpep on applesauce. Peter cannot swallow pills yet, so we open the capsules in applesauce so he can swallow the capsule contents. Stir them in a bit and have Peter eat the applesauce and enzymes. He should swallow the Zenpep “beads” without crushing them. He does not need to eat all the applesauce, just enough to get down the capsule contents. For a snack, he only needs 2 capsules of Zenpep. The medicine works for about an hour, so if it has been an hour since he has eaten last, he will need more Zenpep before he eats again. We are happy to provide applesauce for Peter’s medicine. Please make sure he washes his hands before he eats and wash and sanitize any surface he eats off of. At mealtime, please allow Peter enough time to eat all of his food (or encourage him to eat all of it). Kids with CF have a high calorie, high fat diet due to the body’s decreased ability to digest food. Because of this, high calorie foods should be encouraged. He may also need to have extra snacks if he starts losing weight. Please bear this in mind when you teach healthy eating habits--Peter's diet should include healthy, nutritious foods, but he needs to eat high calorie, high fat foods as well to maintain his weight. We use whole milk, butter, cheese, dipping sauces, gravies, and mayonnaise liberally. Peter should never be in the same room with other people with CF. This is because they could infect each other with bacteria or viruses that thrive in the mucus of a CF patient. If there is another person with CF in the school, we request to be notified. Frequent hand washing is critical because it is the best way to prevent colds. A cold can turn into a lung infection for Peter, which might require hospitalization. Cold/flu season is a tough time and we do the best we can. We appreciate your strict sickness policy; that will help Peter stay as healthy as he can through the school year. When doing activities with shared scissors, glue, markers, etc., please ask Peter to sanitize his hands after the activity is over. The reason for this is to reduce his odds of contacting a cold or virus from other children especially during flu season. If infection becomes a problem, we can provide his own set of craft supplies. Peter may require more frequent bathroom breaks or may express a sudden need to use the restroom. This is due to the digestion issues with CF. He is potty-trained and will tell you if he needs to go to the bathroom other than the scheduled bathroom time. If Peter complains that his stomach really hurts, it is usually because he needs to go to the bathroom, and sometimes he needs to be reminded of that. 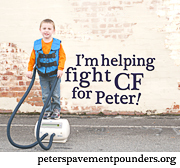 As CF progresses, Peter may cough frequently; it is his body’s natural method to clear his lungs of mucus. The cough is not infectious. Peter should not be asked to suppress coughing or stop coughing. He should be directed to cover his cough into his elbow or tissue (not his hands). Sometimes Peter may need to cough up phlegm and spit it out. This helps clear his lungs of the mucus that clogs his airways. On rare occasion, Peter vomits when his stomach has to get rid of the mucus that has built up there. He also has a touchy gag reflex. If Peter vomits, he is usually just fine right after he has washed out his mouth with a little water. Unless accompanied by a fever or other symptoms, vomiting does not mean Peter is sick. Peter loves to be physically active. In fact, exercise is one of the best ways to keep Peter’s lungs healthy, and we try to exercise everyday. During physical exercise, please make sure Peter gets plenty of fluids. CF causes him to sweat more, so dehydration can be an issue. Please allow him extra water breaks if necessary. Also, during exercise, he may be short of breath or tire quickly. In that case, he may need to stop the activity and/or use his inhaler. Please do not tell the children or Peter that he is going to die of CF. 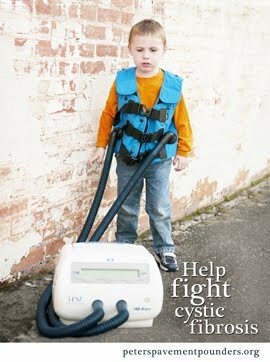 We do not know what the future holds for our little boy or for the treatment of CF. We hope someday there will be a cure. We would also be happy to come into the classroom to teach about CF if needed. Peter may come in late on occasion due to morning respiratory treatments and medication. We will do our best to make sure he is on time. However, it takes up to an hour each morning to complete his medication and treatment regime and that may increase if he has a lung infection or cold. Peter may be absent due to illness more than other children. He also has frequent doctor’s appointments as well as quarterly CF clinic visits. If Peter has an increased cough or labored breathing, you may administer inhaled Albuterol (Ventolin HFA) at school. He should inhale 4 puffs as needed every 4-6 hours for increased cough or congestion. Shake the inhaler and insert it into the spacer. Administer a puff, holding Peter’s face to the spacer mask, then wait until Peter has breathed 6 breaths. Repeat in the same manner for the remainder of the puffs. If Peter uses his inhaler frequently during a week, then I will take it home to clean it at the end of the week. Peter has chronic sinusitis due to CF, especially in the winter. We frequently use sinus rinses and a nasal steroid to help clear out the mucus so he can breathe. If this becomes necessary, we will provide instructions for administering this treatment.